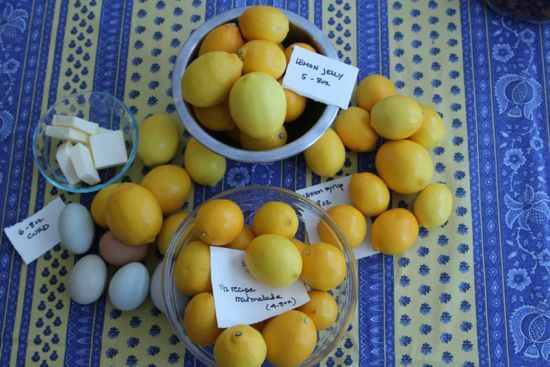 I’ve been working through a glorious box of Meyer lemons from the Lemon Ladies. Every year, I treat myself to a box of lemons from California and their lemons are the most beautiful, floral, bright sunny yellow fruits I’ve ever seen. I made lemon possets, of course, because they’re just about the best dessert in the world. Serve with gingersnaps. I made lemon curd because it is a food of the gods. I’ve toyed with a dozen recipes for shelf stable lemon curd, but I just don’t feel good about putting dairy and eggs in a jar and canning it, even pressure canning, so I put lemon curd in the refrigerator, where it lasts about three months, or in the freezer, where it will keep for six months. An 8-ounce jar will cover an 8 by 8-inch baking pan of shortbread for lemon bars in a jiffy. 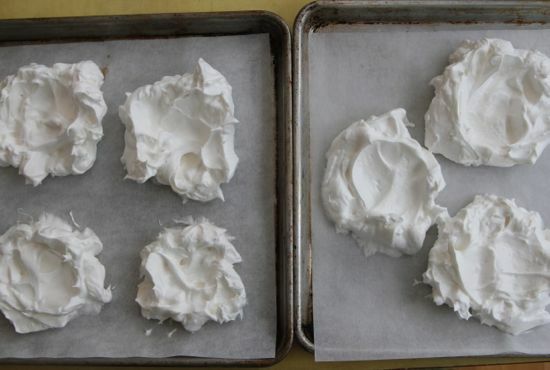 Or whip up egg whites into little pavlovas and plop some bright curd in the center, like the sun breaking through a cloudy sky. Of course, there was Meyer limoncello, but I also made crema di Meyer limoncello with a smooth as satin lemon-y dreamsicle flavor that is divine. With all those zested lemons, I squeezed almost a cup of beautiful lemon juice. I had just enough juice and three lovely lemons remaining. Reluctantly, I continued my experiments in marmalade. Sadly, I still don’t have a recipe I like. Oh well, there’s always next year. Zest the lemons using a vegetable peeler, removing only the yellow skin and leaving the white pith behind. Divide the zest between to 2 quart jars. Cover with vodka, cover the jars and place in a dark closet for two weeks. 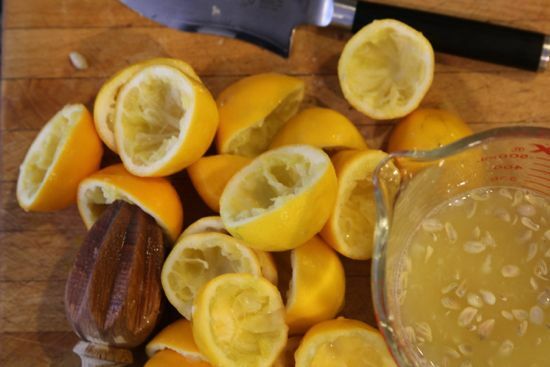 Remove the lemony vodka from the closet. Strain through a cheesecloth lined strainer and divide between four jars. Heat the sugar and water to boiling. Remove from the heat and cool completely. Add the cooled sugar syrup to 4 cups of the lemon vodka. Stir well and bottle in gift bottles. Set aside in a cool, dark spot for one month before gifting or drinking. Keep and serve cold from the freezer. Heat the milk, sugar and vanilla seeds to a simmer, stirring to dissolve the sugar. Remove from the heat and cool completely. Combine with the lemon flavored vodka and shake well. Pour into bottles suitable for gifting. Store in the freezer and defrost for 30 minutes before serving. Note: Because homemade liqueurs are one of my favorite hostess gifts, I keep a big jug of cheap vodka on hand. I know many people use grain alcohol for infusions, but that harsh back of the throat bite gets to me. PS Oh, good golly, I’m exhausted. How do parents of little humans do it? Morty has turned our house upside down! He is such a joy and we love his presence so much. He makes us laugh all day and Louie just loves him. Just to confirm some details of the recipe: Zests from 12 Meyer lemons are mixed together with the 8 cups vodka. 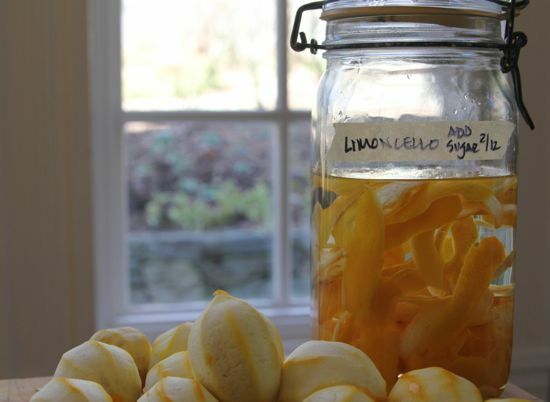 The simple syrup for limoncello is made with 2 cups sugar and 2 cups of water. The second 2 cups of sugar is for the Crema. BTW, agree wholeheartedly with your comments about using cheap vodka rather than the grain alcohol. Which actually costs more than the vodka the last time I shopped. Yes, exactly, Susan. You infuse the vodka with the lemon zest and then divide it up, using half for limoncella and the other half for the crema di limoncella. I don’t think we can even get grain alcohol in Colorado and I’m OK with that but I have found that I can purchase a higher proof vodka than normal which I think extracts more of the lemon essence. I’m so with you…nothing about a harsh bite is appealing! Will the crema di limoncello freeze solid? Will determine what kind of bottles to use. Yes, it does freeze solid! 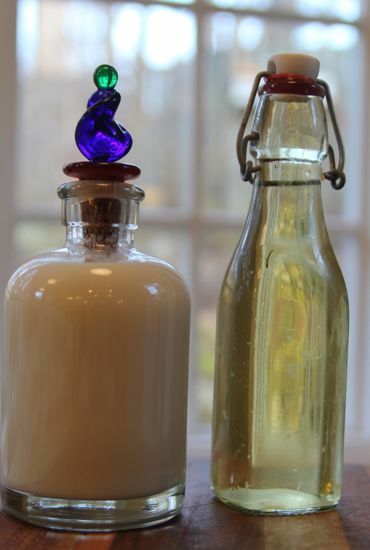 Suggestions for best bottles to use with the crema? Hi Cathy! It’s been awhile since I checked the blog, LOVE love love the new look. Thanks for the meyer lemon curd freezer tip, I had no idea and am thrilled to learn something new. Your blog is wonderful, thank you so much for sharing with us. Hi! I would like to make a bottle of Blood Orange – Tangerine-Cello for a wedding gift. I’ve already zested and it’s been nearly a month, so it’s ready to make whenever I want. I’m hoping someone will have a good answer. How long will the couple have before needing to refrigerate the bottle? What is the shelf life of a simple Cello recipe? I used Everclear, blood orange and tangerine zest and I usually use 4 packets of Monk Fruit sweetener, one cup of sugar and 5 cups of water, for the simple syrup and add it to the strained/infused Everclear. I’ve always put it right into the fridge or freezer, but I need this bottle to make it across the country, as a gift for a couple, that will not be home right away to refrigerate it. Any help, advice or comments would be very appreciated! Thank you!! Hi Janice, Your Whatever-Cello is shelf stable and will travel and keep indefinitely without refrigeration. I keep mine in the freezer because it’s so much better ice cold! How long will crema cellos last? I have one we brought back in the fridge and the other one isnt. Thanks!